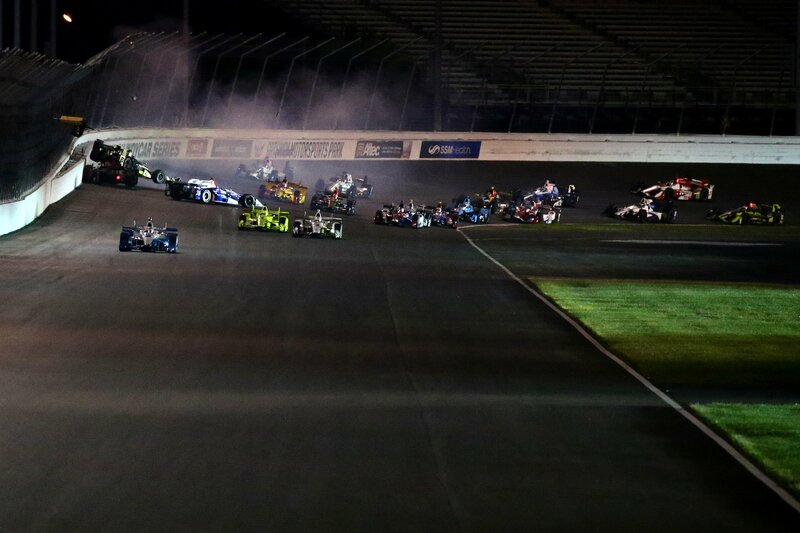 View full Gateway Motorsports Park INDYCAR results below. Sebastian Bourdais is back in the field. This is his first race back since his crash in Indianapolis back in May. It’s a fresh repave for 248 laps around GMP. A big fast short track with bad fast open wheel rocket ships. No more bumps, just side-by-side racing. 3 wide salute. Will Power and Josef Newgarden will lead the field to green. Trouble! Caution. We haven’t even gone green yet. Tony Kanaan is around under the parade laps! What?! He lost it all on his own. Cold tires, he might have clipped the apron. He backed it into the fence. A bit of damage but they might be able to repair it. In deed, he does. Others hit the pits to top off. Green flag, Will Power pinches the inside wall down the front stretch. Newgarder takes a much wider entry to turn 1. He powers by on the outside, to the lead. Trouble!!! Will Power is around, by himself. After setting a new track record, he looped it in turn 1 and will be carried away on the wrecker. Ed Carpenter got collected as well, he jumped on top of Power while trying to avoid it. Wow! Green, Newgarden leads. The field is single file out of turn 2. The field looks to be calmly testing the waters after two early incidents. Lap 40, Penske 1-2-3 at the front. 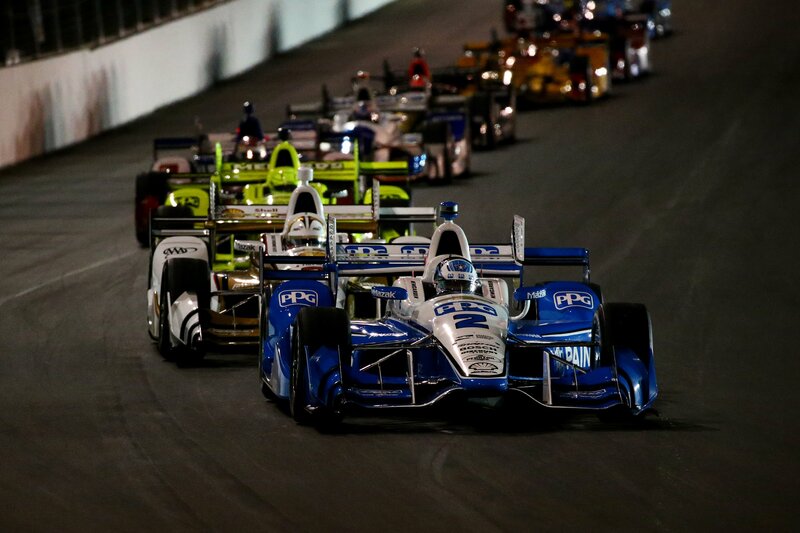 Josef Newgarden, Helio Castroneves and Simon Pagenaud run nose to tail. However, Conor Daly is the driver on the move, he’s up to 9th. Lap 56, pit stops have begun. Carlos Munoz is the first car on pitlane. Daly follows on lap 58. Lap 62, Newgarden in and out of the pits. He lost no time, in fact, increased the gap. He’ll resume as the leader when the field cycles. Caution. JR Hildebrand is in the wall in 3-4. The car just went straight at the center of the corner. That was either a tire or suspension failure. The field hits pit road. Castroneves takes the lead on pit road. Slow stop for Newgarden. Green flag, Pagenaud looks to the inside of Newgarder under the flagstand. Not enough. Saavedra caught the inside rumble strip, big wiggle, big lift, 3 cars roll by on the outside. Lap 150, Castroneves leads by 1 second. Newgarden trails by 2 seconds. Castroneves is lifting a little earlier at corner entry. Some teams are suffering from tire blisters. Lap 158, Castroneves is on pit road. He stalls leaving his box. He gets it going by he probably just lost the lead. Lap 160, Newgarden is in, heavy wheel spin leaving the box. Newgarden nips Pagenaud on exit. Newgarden will cycle to the lead. Castroneves drops from the lead, back to 4th. Lap 167, trouble! Max Chilton is another car to lose it, all on his own. He looped it in turn 2 and backed it into the fence. Caution. Green, lap 175. Newgarden snakes directly to the inside wall, the whole field follows. Newgarden leads out of turn 2. Newgarden still leads. 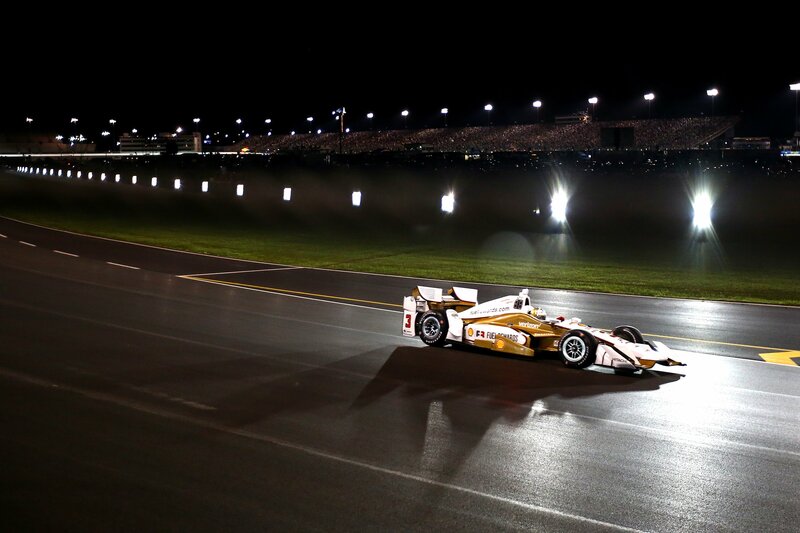 Castroneves remains 4th, it’s hard to pass at Gateway Motorsports Park. Lap 204, Caution. Ryan Hunter-Raey has scrapped the wall at the exit of turn 2. Broken suspension. He just missed his apex, got out of the groove and couldn’t turn it enough off the corner. The field hits pit road. 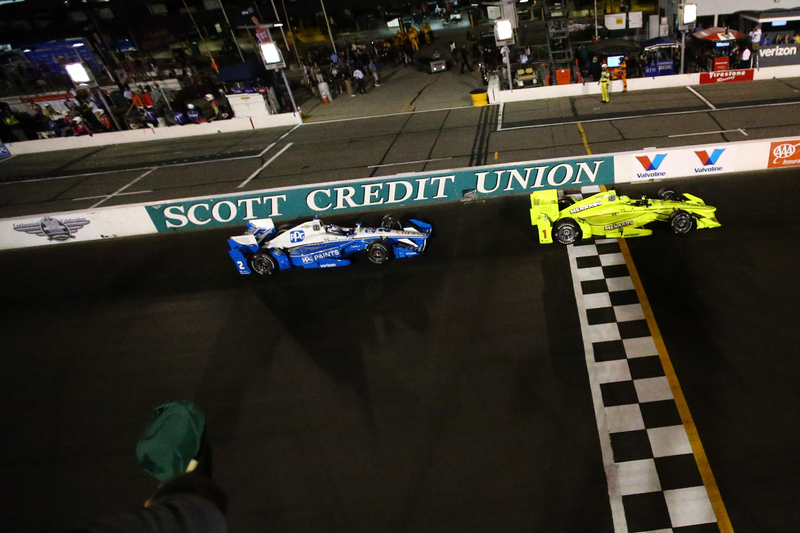 Simon Pagenaud beats Newgarden off pit road, by about 3 feet. Newgarden didn’t stall but he lifted to stop wheel spin. That was the difference. Green flag, 36 to go. The field again snakes to the infield wall. Newgarden has a run, he looks to the outside at the entry of turn 1. He’s not going to make it work out there but he’s trying to pinch Pagenaud’s entry and possibly carry more speed on the exit. It doesn’t work. Lap 31, Newgarden has another run. He makes a quick dart to the outside. It’s a fake, he cuts back to the left. Pagenaud left enough room on the inside for 1 car, but nothing more. Newgarden forces his way in there. They rub fenders at the entry to turn 1! Pagenaud has to left, he’s way out of the groove. Pagenaud falls to 3rd. Newgarden has regained the lead. 20 to go, Pagenaud is desperate for a way by Dixon. Pagenaud is trying to get a run off turn 4, then beat him to turn 1. He just needs to time it perfectly. 5 to go. Newgarden leads by .9 second. Dixon 2nd and Pagenaud still 3rd. The gap looks to be closing. 1 to go, there’s pressure from behind but nothing to stress about. 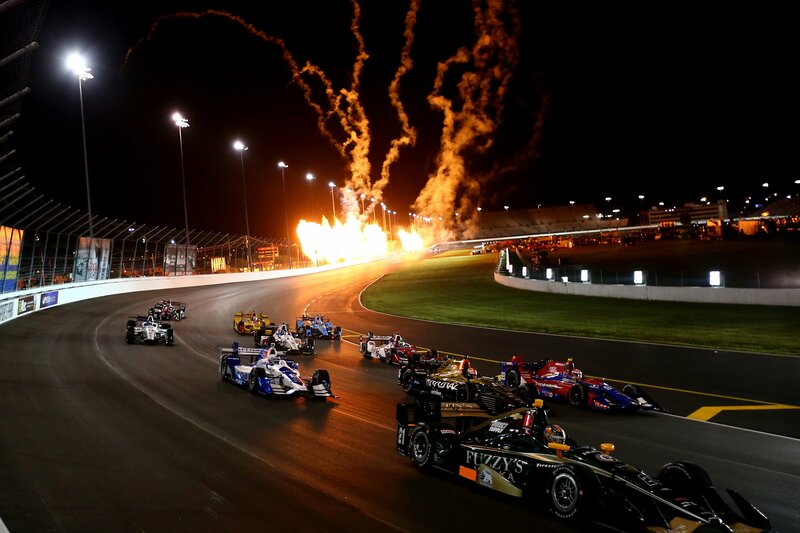 Newgarden cruises to win at Gateway Motorsports Park. It’s his 4th win of the season. It’s also the 5th straight win for Team Penske. 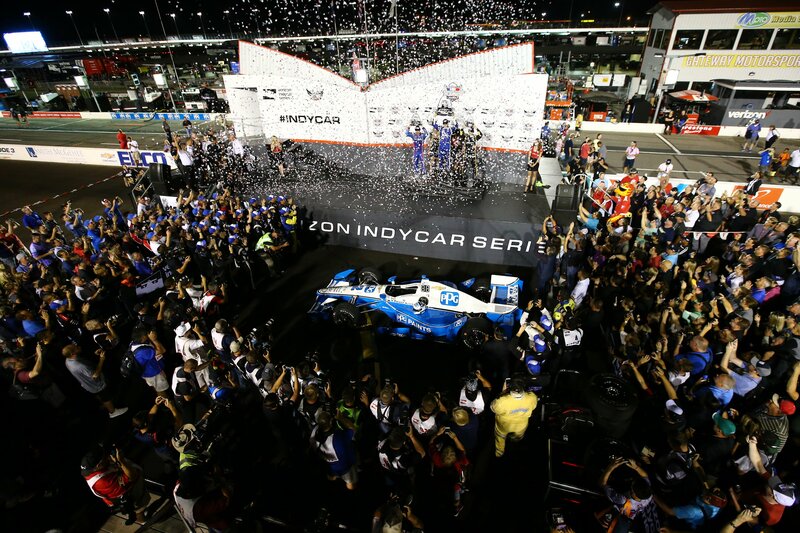 Next up, Indycar heads to Watkins Glen International. Josef Newgarden (1st): “You know, with Simon there, I wanted to get to the inside of him. He gave me the lane. So, I took it!